I’m not going to spend a lot of time on this – I’ve covered it elsewhere. First, most organizations do not follow a rigorous process for project prioritization. You can see the signs all over the place. Many organizations feel like they have a rigorous process based on their PPM tool (or even spreadsheets), but those are not typically valid project prioritization techniques. Simple scoring mechanisms may make it feel scientific, but they typically leave you open to bias and to an ultimate lack of support for the portfolio. This is why it’s still hard to pick a portfolio that can be delivered with the resources you have, and it’s why people still try to “jam projects in”. In fact, recent research from the University of New South Wales¹ suggests that there are only 2 suitable methods for selecting projects. They are structured processes for selecting projects that are designed for complex organizations making complex decisions. They are called AHP and DEA. Why is it that these are valid processes and others are not? I’m no expert on DEA, but know a few things about AHP. In fact, we like AHP (the Analytic Hierarchy Process) so much, we put it at the heart of our project prioritization software. So what is it that makes AHP so good…? Well, the bottom line is that it lets you answer your CEO’s question clearly. Using AHP you can clearly explain why you are making the investments in projects that you are and you can demonstrate how value-for-money has been optimized. And, in this case, what’s good for the CEO and CFO is good for the portfolio. 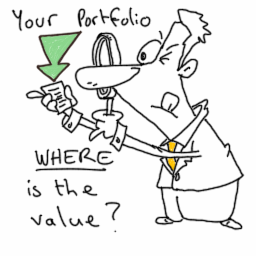 Having clarity about the value of the projects in the portfolio, having your stakeholders buy in to that value, is critically important for project success rates. Failure to have this level of clarity and buy-in is, usually, the root cause of having too many projects and too few resources. How does this happen? Well, crucially (and unlike PPM tools or hacked together spreadsheets), it’s based on decision science. It starts with a structured process, one that’s designed to minimize bias and to maximize the benefits of collaboration, for agreeing what “value” means (this webinar explains the hows-and-whys). This is where pretty much every other method fails and it’s a critical failure. Boom! Now we can answer the CFO’s and CEO’s questions and we can do it with the confidence that we got there with a defensible, independently validated methodology.